Your child’s school is an important part of your community. Today, it seems that many parents believe their child’s school doesn’t want or need them, or that their part is just to get them to the door or bus. Not true! You have tremendous opportunity to not only keep up with what your child is learning, but to build up, support and bless the educators who impact every single student in their school each day of the school year. In addition to communicating your needs (using the PEACE-ful approach, of course!) look for opportunities to affirm teachers for the work they do and the care they give to your child. PEACE has provided suggestions on how you can begin or continue building positive relationships with your child’s teacher and school staff. Often blessing can happen incidentally. As you drop your children at school or pick them up at the end of the day, think about ways that you can make a difference and make the most of every opportunity, no matter how small. As you cross paths with teachers, your child’s principal and even the crossing guard on the way home, make an effort to be polite, sincere, and caring. You never know what one act of kindness can do! • When meeting a teacher bless with a coffee/tea, muffins, etc. • Volunteer for an after school activities/club— sports, chess, science, technology, robotics, health and wellness, etc. The Ontario Ministry of Education has stated that parents are to communicate with the school so that the school is aware of the concerns. They also want parents to list specific concerns. Sound like a lot of work? Don’t worry, PEACE has created parent forms that make it easier to share your needs in a clear and respectful manner. We’ve researched all the Ministry documents to ensure that by using the PEACE forms, your response will meet their requirements all while using the PEACE-ful approach. Click below to download the resources you need to communicate your needs effectively with your school. When parents request a lesson accommodation, the school is supposed to provide an alternative assignment. Why not provide the solution for the school? PEACE has developed alternative, independent study units for Gr. 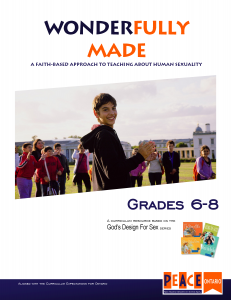 6, 7 & 8 (other grades are currently in development) that help the child connect the learning to their faith. Instead of having your child sit in the hall, request that he/she be allowed to work independently on this assignment. Keep communication open with your child and teacher about what they are learning and how to frame it in a biblical worldview.